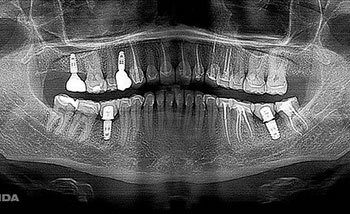 While restorative dental procedures are seldom without challenges, some cases are inherently more complex than others. This report will present a case involving the coordination of multidisciplinary care across several disciplines to restore form and function to a 34-year-old woman who presented with dental erosion, a postural tongue habit, altered tooth positions and supragingival caries. FIGURE 1. Full face, pretreatment smile. The patient’s history included social conditions that contributed to an extended treatment time. This included evaluating the patient’s behavior and choosing the correct treatment designed to save, rather than remove, her natural teeth. Multidisciplinary therapy, with its attendant variables in treatment options, requires each specialist to agree on a care plan that takes into consideration the definitive outcome. The full-mouth reconstruction presented here demonstrates the efficacy of multidisciplinary evaluation involving erosion, altered tooth positions, caries and tongue thrust. Without the combined periodontal, prosthetic, endodontic and myofunctional therapies, long-term success would have been jeopardized. Social History: The patient reported recovering from a methamphetamine addiction four years prior to treatment.2 She also reported bulimia nervosa in her early teens, and anorexia nervosa in her early twenties.3 At the time of treatment, the patient felt in control of her life and diet. Caring for her 11-year-old son as a single parent required accountability that prevented her from relapsing. Treatment began six months after initial evaluation in order to establish that a sustained recovery was possible. 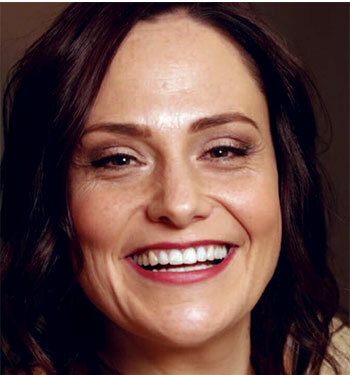 Her vertical dimension and freeway space measured within normal limits, indicating some further active eruption, as erosion and decay destroyed the maxillary tooth structure, resulting in an adult smile displaying more gingiva and diminished crowns. 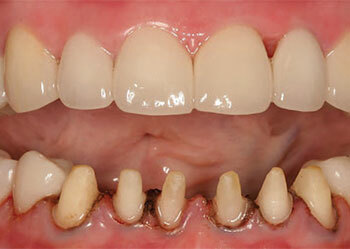 The patient also had gingivitis, without any evidence of periodontitis. FIGURE 2. Maxillary pretreatment occlusal view showing erosion, caries, splayed anterior teeth, failing restorations and two missing teeth (#2 and 5). FIGURE 3. Mandibular pretreatment occlusal view showing less erosion than the maxillary arch, caries, splayed anterior teeth, failing restorations and two missing teeth (#18 and 30). FIGURE 4. Frontal retracted pretreatment view in maximum intercuspation. The maxillary and mandibular anterior teeth showed splaying, likely the result of a tongue thrust. In order to treat the tongue thrust, the patient’s multidisciplinary needs were addressed by referral for orofacial myofunctional therapy. The patient had 3 mm of freeway space prior to treatment, and her profile revealed that when relaxed or in maximum intercuspation, she did not appear to be over-closed vertically (Figure 4). The cephalometric radiograph revealed she was not skeletally closed. Her temporomandibular joint had a normal range of movement and was completely asymptomatic, with a 5.5-cm opening and 12 mm left and right excursions. 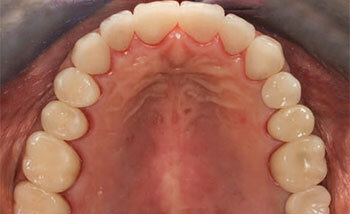 The main clinical focus was choosing the proper treatment for the severely eroded and carious maxillary teeth. One possibility would be to extract all upper teeth and place an immediate denture. Another would be placing four implants after the maxillary extractions were completed in the All-on-Four technique.1 A 14-tooth bridge/superstructure would be fabricated and connected to the four implants — with the esthetic need to remove enough bone while extracting the teeth to avoid displaying the transition between the gingiva and prosthetic appliance. FIGURE 5. Panoramic pretreatment radiograph demonstrating long, parallel roots and four missing teeth. A diagnostic wax-up was completed by the laboratory in order to establish the correct position of the central incisors.10 This could have been completed with computer aided design/computer aided manufacturing (CAD/CAM).11 Fabricated on the model made from the diagnostic wax-up, a plastic stent was placed in the oral cavity and it demonstrated acceptable gingival exposure (Figure 6). 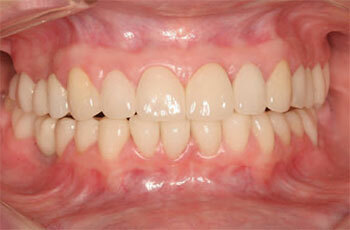 longer gingivally to reduce gingival display while smiling. mucogingival flap reflected in order to see the level of bone relative to the top edge of the stent as a guide for bone removal. An average of 3 mm of supragingival soft tissue will rebound coronal to the alveolar crest, and can take a minimum of three months to complete vertical growth.16 Close to 3-mm gains occurred at six months, with a healthy biologic width.17,18 The provisional contours and axial inclinations seen in Figure 9 were poor. The anterior teeth were buried in the lower lip, with excessive vertical and horizontal overjet. An hour of chairtime was spent recontouring this provisional restoration. Figure 10 demonstrates the contour changes at five months postsurgery. The team noted a deficient papilla between teeth #9 and 10. Preparations were refined and impressions were made for the laboratory (Figure 11). Acrylic resin vertical stops, fabricated at the appropriate occlusal vertical dimension, were used to register centric relation. FIGURE 8. Stent in situ demonstrating the amount of bone removed, at least 4 mm apical to the top of the blue line (or edge) of the stent. FIGURE 9. Maxillary provisional restorations are too long and their axial inclinations are incorrect. FIGURE 10. Postop view at five months shows the altered contours, lengths, and axial inclinations of the provisional restorations. The periodontium is maturing, yet there is a deficient papilla between teeth #9 and 10. FIGURE 11. 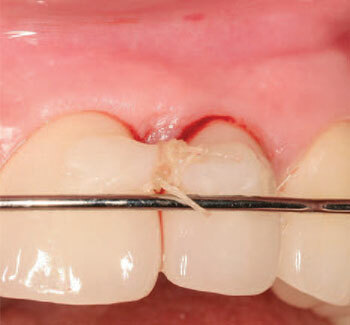 Maxillary preparations with deflection cords present. Mandibular posterior CAD/CAM restorations were completed to the proper vertical dimension and bonded in place. Next, the six lower anterior teeth were prepared for CAD/CAM restorations that were bonded the same day as the posterior restorations. Deflection cords were placed to protect the epithelial attachment between #24 and 25 (Figure 12). The preparations on the mesial of these teeth were extended to approach the deflection cord in an effort to close the space prosthetically, with an emergence profile that is within normal limits (Figure 13). FIGURE 12. 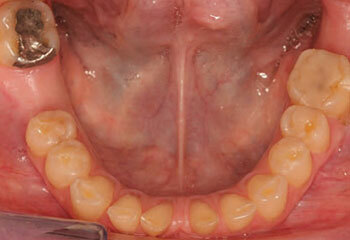 Nordland Class 1 papilla defect persists between teeth #9 and 10 following placement of the definitive restorations. The mandibular anterior teeth are prepared for CAD/CAM restorations extending apically in close proximity to the deflection cords to be able to provide maximum length without impinging on the biologic width to facilitate creating a better emergence profile and to close the space between #24 and 25. FIGURE 13. In this CAD/CAM proposal, the mandibular anterior restorations are designed in full contour and adjusted intraorally to the appropriate occlusion. The three-month postoperative visit revealed an improved papilla between #9 and 10 (Figure 15). The mandibular milled lithium disilicate crowns have more gingival and incisal embrasure space with the anterior teeth. The final treatment included four implants and abutments, 14 maxillary pressed medium-translucency lithium disilicate restorations (anterior layered), 15 mandibular CAD/CAM milled lithium disilicate medium-translucency restorations, and nine teeth treated endodontically (Figure 16, Figure 17 and Figure 18). FIGURE 14. The composite bar across the facial of teeth #9 and 10 provides anchorage for the suspensory suture engaging the rolled, palatal, subepithelial connective tissue graft. The removable retainer compresses the connective tissue on the palate and helps retain tooth position. Following treatment, the patient resumed using facial muscles for smiling that had not been used for years. In the glamour photograph, the patient had a facial and her hair colored. No other cosmetic procedures were completed (Figure 19). To date, the patient is pleased with the treatment result and conscientious about proper oral hygiene and ongoing professional care. Considering this treatment was partially pro bono, her sense of ownership is unique. The patient willingly spent many hours in the dental chair, and had no reservations with surgery, root canals or restorative treatment. Given her past addictions, she refused pain medications and opted for only local anesthetic. FIGURE 15. Resultant improved papilla. lithium disilicate pressed restorations. The anterior restorations are cut back and layered. In ultimately choosing to save her natural teeth and employ the “All-on-Four” approach, many factors outside of dentistry were considered. Given the obstacles the patient faced (single parent, history of substance abuse, and history of disordered eating), social considerations and cost played major roles in choosing the best treatment. The least expensive option would have been an immediate denture. Given the patient was only 34 years old, this option seemed too severe. Another less expensive choice would have been the “All-on-Four” treatment; however, the display of the prosthetics and gingiva would have been esthetically unpleasing.1 It was thus deemed the higher cost to save and restore function to the eroded and decayed teeth outweighed the financial burden. Fortunately, volunteer clinicians and funds were recruited that allowed the patient to afford the optimal treatment: saving and restoring her dentition. FIGURE 18. Posttreatment panoramic radiograph. Endodontic treatment was necessary to save teeth with irreversible pulpitis, as many required root canal therapy due to the extent of the preparations dictated by the pretreatment loss of tooth substance. Additionally, the patient completed all myofunctional therapy to correct her tongue thrust, thus increasing the chances the teeth would remain in place following treatment. FIGURE 19. Posttreatment glamour photograph. This case presented challenges at different stages during treatment. The challenges and solutions were documented photographically and included here to demonstrate that obstacles can be overcome. For example, there were communication problems with the laboratory regarding the correct position of the central incisors for the diagnostic wax-up. Considerable time and effort were spent reevaluating the patient’s smile and making corrections in the provisional (and without local anesthetic).26 The soft tissue management became increasingly difficult, and restoring the anterior papilla required researching the literature and discussions with mentors. Completing the mandibular arch in one day using CAD/CAM to design and fabricate with two milling machines provided an additional challenge.28 The results of the maxillary laboratory pressed and layered lithium disilicate medium-translucency restorations can be compared to the mandibular CAD/CAM lithium disilicate medium-translucency milled restorations (Figure 20). A lithium disilicate block with higher chroma and lower value was selected for the cuspids. The blocks selected for the maxillary lateral incisors had the highest value, but with lower chroma. The maxillary central incisors and mandibular incisors had a value in between the cuspids and maxillary lateral incisors, including the posterior teeth. FIGURE 20. Lip retracted posttreatment frontal view. 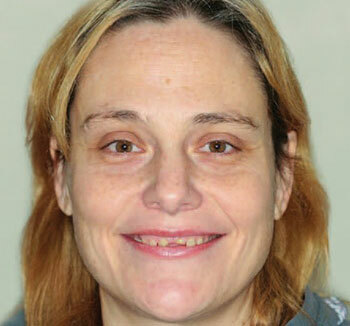 The decision was made to restore this patient’s dentition by saving all of her remaining natural teeth and placing four implants in place of the four missing teeth. Provided the patient did not relapse from previous addictions, this was a viable treatment option. She was informed at the start of treatment that if she did not complete and practice myofunctional therapy, her teeth would move after treatment was completed. Fortunately, the patient was compliant and completed all tasks that were asked of her throughout the extended treatment, while maintaining meticulous oral hygiene. Much of her success was a result of behavioral changes. In this light, patient care may benefit from this case report if clinicians consider social factors (e.g., eating patterns or substance abuse) when choosing the best therapy and integrating multidisciplinary treatment in order to yield the best outcomes. The references that accompany this article can be found at ­DecisionsInDentistry.com. The authors wish to acknowledge: Dr. Robert Fauche for his help with this manuscript; Dr. Tonya Loving, who coordinated with the patient’s church, Timberlake Church, and dental professionals to donate time, funds and materials; Smile Design Laboratory in Bellevue, Washington, which donated the upper maxillary arch restorations; Dr. Lisa Thoms, who donated implants and implant abutments; and Jim Svare of Patterson Dental, who donated 15 lithium disilicate blocks. A special thanks to my associate, Dr. Mindy Gerakos, who restored the two mandibular implants, and dental assistants Carol Olsen and Tiffany Elder. Clinicians and patients should consider all treatment options, and the potential consequences of those options, before deciding on the most appropriate therapy. In multidisciplinary therapy, with its attendant variables in treatment options, each specialist should agree to a care plan that supports the definitive outcome. If problems occur during any phase of treatment, read the literature and seek out a mentor to find potential solutions. In addition to other clinical choices, both pressed and layered lithium disilicate laboratory restorations and milled CAD/CAM lithium disilicate restorations are acceptable materials in full-mouth reconstructions. The treatment provided for this patient provides an opportunity to compare lithium disilicate blocks fabricated using two different procedures. Patient care may benefit from this case report if clinicians consider social factors (e.g., eating patterns or substance abuse) when choosing the best approach to therapy. In complex cases, multidisciplinary treatment is likely to yield the best outcomes. Maló P, de Araújo, Nobre MD, el at. Short‐term report of an ongoing prospective cohort study evaluating the outcome of full-arch implant‐supported fixed hybrid polyetheretherketone‐acrylic resin prostheses and the All‐on‐Four concept. Clin Implant Dent Relat Res. 2018;20:692–702. Bassiouny MA. 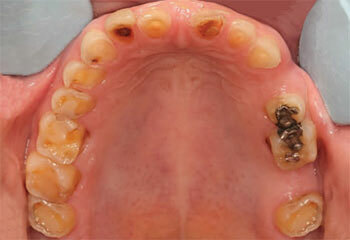 Dental erosion due to abuse of illicit drugs and acidic carbonated beverages. Gen Dent. 2013;61:38–44. Dario LJ. Prosthodontic rehabilitation of a bulimic. A case report. Periodont Rest Dent. 1986;2:23–33. Goldman HM, Cohen DW. Periodontal Therapy. 4th ed. St. Louis: Mosby; 1968. Gottlieb B, Orban B. Active and continuous passive eruptions of teeth. J Dent Res. 1933;13:214. Allen EP. Surgical crown lengthening for function and esthetics. Dent Clin North Am. 1993;37:163–179. McGuire MK. 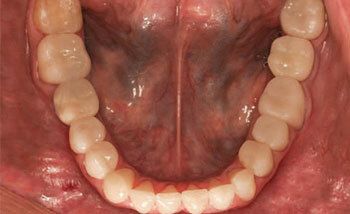 Periodontal plastic surgery. Dent Clin North Am. 1998;42:411–465. Chu SJ, Hochman MN, Fletcher P. A biometric approach to aesthetic crown lengthening: Part II — Interdental considerations. Pract Proced Aesthet Dent. 2008;20:529–536. 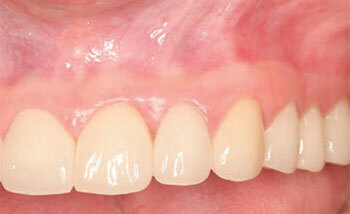 Fletcher P. Biologic rationale of esthetic crown lengthening using innovative proportion gauges. Int J Periodontics Restorative Dent. 2011;31:523–532. Marxen TO. Upgrading Previously Placed Porcelain Veneers. Available at: https:/ / www.dentistrytoday.com/ aesthetics/ 347-upgrading-previously-placed-porcelain-veneers-materials-and-technique. Accessed March 13, 2019. Cook S. Benefits of the diagnostic: Digitally designed or waxed. Available at: https:/ / www.dentaleconomics.com/ articles/ print/ volume-108/ issue-7/ science-tech/ benefits-of-the-diagnostic-digitally-designed-or-waxed.html. Accessed March 13, 2019. Perez JR, Smuckler H, Nunn ME. 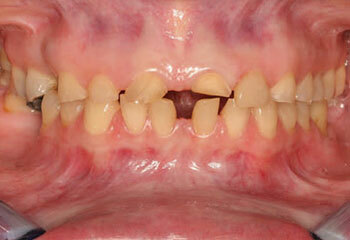 Clinical evaluation of the supraosseous gingivae before and after crown lengthening. J Periodontol. 2007;78:1023–1030. Schluger S. Osseous resection: a basic principle in periodontal surgery. Oral Surg Oral Med Oral Pathol. 1949;2:316–325. Schmidt JC, Sahrmann P, Weiger R, Schmidlin PR, Walter C. Biologic width dimensions — a systematic review. J Clin Periodontol. 2013;40:493–504. Tarnow DP, Magner AW, Fletcher P. The effect of the distance of the contact point to the crest of the bone on the presence or absence of the interproximal dental papilla. J Periodontol. 1992;63:995–996. Eleutério D, Marcela K, Ribeiro C, et al. Surgical crown lengthening: a 12-month study —radiographic results. J Appl Oral Sci. 2007;15:280–284. Hempton TJ, Dominici JT. 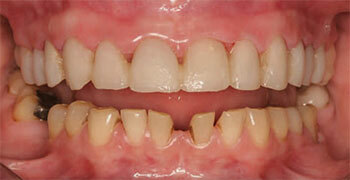 Contemporary crown-lengthening therapy. J Am Dent Assoc. 2010;141:647–655. Deas DE, Moritz AJ, McDonnell HT, Powell CA, Mealey BL. Osseous surgery for crown lengthening: a 6-month clinical study. J Periodontol. 2004;75:1288–1294. Ma PS, Nicholls JI, Junge T, Phillips KM. Load fatigue of teeth with different ferrule lengths, restored with fiber posts, composite resin cores, and all-ceramic crowns. J Prosthet Dent. 2009;102:229–234. Libman WJ, Nicholls JI. 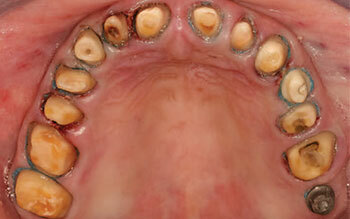 Load fatigue of teeth restored with cast posts and cores and complete crowns. Int J Prosthodont. 1995;8:155–161. Chaiyabutr Y, Kois JC, Lebeau D, Nunokawa G. Effect of abutment tooth, cement color, and ceramic thickness on the resulting optical color of a CAD/ CAM glass-ceramic lithium disilicate-reinforced crown. J Prosthet Dent. 2011;105:374–382. Nordland WP, Tarnow DP. A classification system for loss of papillary height. J Periodontol. 1998;69:1124–1126. Scharf DR, Tarnow DP. Modified roll technique for localized alveolar ridge augmentation. Int J Peridontics Restorative Dent. 1992;12:415–425. Nordland WP. Restoration of lost interdental papilla: a surgical technique. Compend Contin Educ Dent. 2018;39:544–549. Spear F. Embrasure and Papilla Form in Anterior Asthetics. Available at: https:/ / spearaesthetics.com/ pdf/ materials-and-techniques/ Spear-Embrasure_ &_ Papilla_ Form_ in_ Anterior_ Esthetics.pdf. Accessed March 13, 2019. Yuodelis RA, Faucher R. Provisional restorations: an integrated approach to periodontics and restorative dentistry. Dent Clin North Am. 1980;24:285–303. Wagenberg BD, Eskow RN, Langer B. Exposing adequate tooth structure for restorative dentistry. Int J Periodontics Restorative Dent. 1989;9:322–331. Juliani DM. Efficient Chairside Full-Mouth Reconstruction Workflow Using e.max. Available at: https:/ / www.cerecdoctors.com/ magazine/ issues/ num/ 42. Accessed March 13, 2019. Choi SK. Use of CAD/ CAM technology in restorative practice. Decisions in Dentistry. 2018;4(7):23–27. From Decisions in Dentistry. April 2019;5(4):10,12–14,17. Troy O. Marxen, BS, is a research scientist at the University of Washington with experience in myofunctional therapy. He will be entering first-year medical school at Emory University School of Medicine.